ATTENTION 10% Discount if you book a 2-night stay or get the third lowest rate night free when you book a stay for Jan 2nd -- Mar 1st and mention the discount when you inquire excluding all holidays! 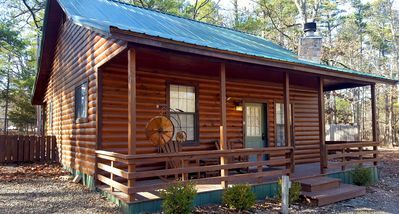 Two Birds One Stone is an authentic 2 bedroom cabin with loft and is great for families or couples! 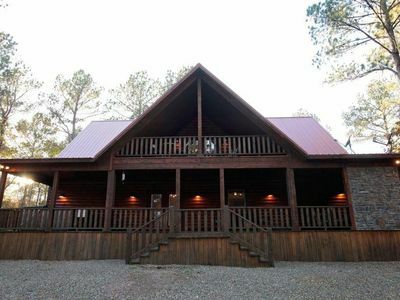 You have plenty of room to enjoy yourselves in this awesome cabin with 2 downstairs queen bedrooms, 2 full baths, 2 full beds in the loft and a new queen sofa sleeper which gives room to sleep 10 comfortably! 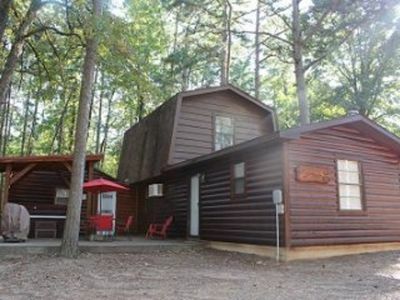 There is a flat screen TV in each bedroom and the loft and a 50 Inch flat screen in the living room. 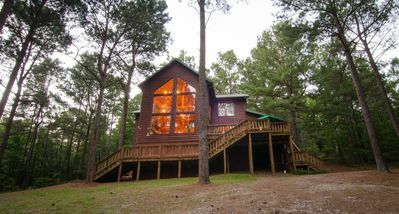 Come and enjoy your coffee out on the wrap around back deck looking out on the wooded property. 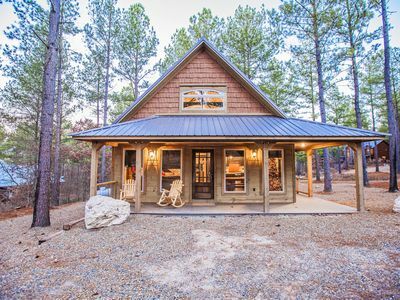 Two Birds One Stone has plenty of room to hang out inside or outside with a large kitchen table, spacious porch, and big yard. 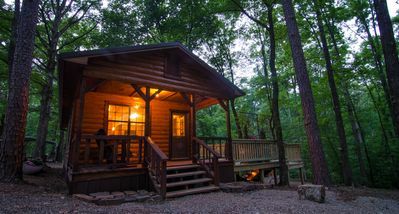 Make memories on a cool night around the outdoor fire pit and roast some marshmallows, or cook a great meal on the charcoal or gas grill; whatever your preference is Two Birds One Stone is sure please. 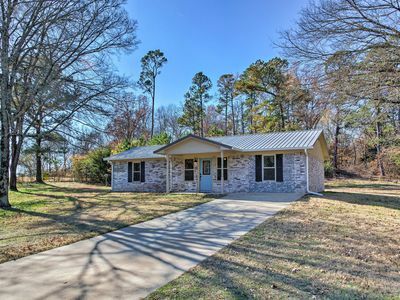 The kitchen is fully furnished with full size appliances, dishes, cookware, flatware, bake-ware as well many small appliances. Bed and bath linens are provided. 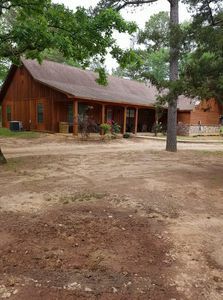 Two Birds is located off of Hwy 259 A, Dam road. 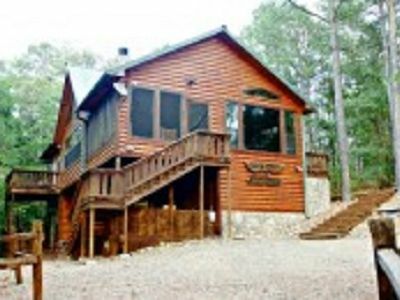 The Broken Bow Lake is approximately 1 1/2 miles from Two Birds One Stone and the cabin is close to all the restaurants, gift shops, and other area attractions. 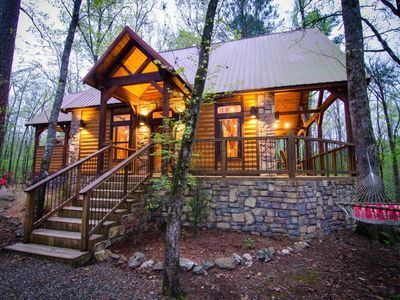 This cabin is located in the quiet Timber Ridge addition. 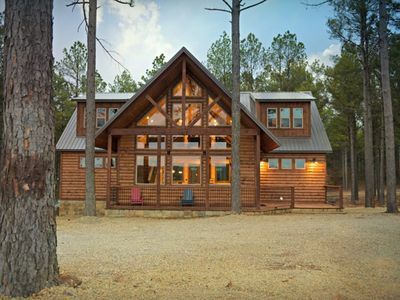 Two Birds has a pull-through driveway so you can easily bring your boat, pontoon, or jet skis. Pet friendly with a small pet fee that will be added after you inquire about pets. 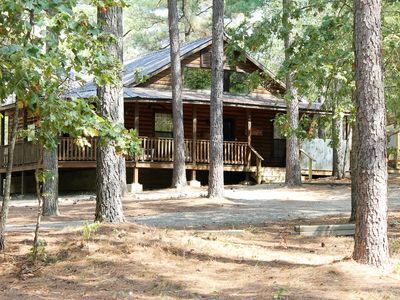 Check-In after 3 pm Mon-Sat, 4 pm Sun, and Check-Out is 11 am daily. 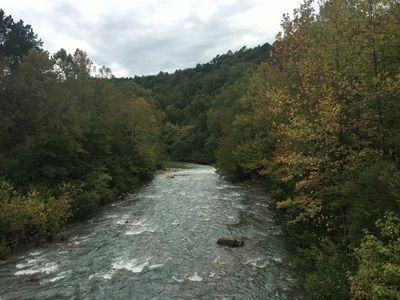 From the Martin Luther King red light by Pruetts Foods in Broken Bow take Hwy 259 North about 11 miles, look for a JCT 259A sign then a green sign with Broken Bow Dam on it. You will immediately turn on the next road to the right which is 259A Dam Road. 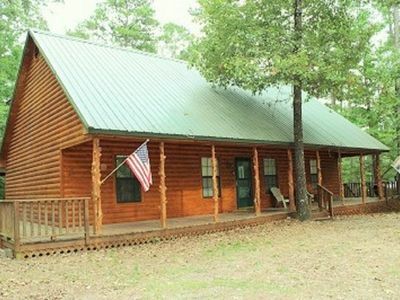 Travel about 1 mile and look for a road to the right with a sign that says Timber Ridge. 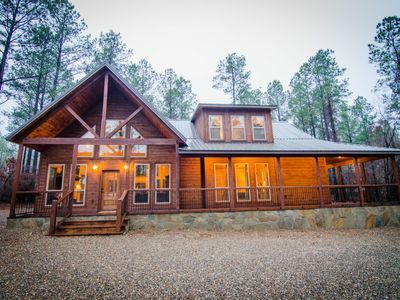 Turn right and go to the stop sign and turn right, follow the road around a left hand curve, look for a white sign with Moonlit Mountain Cabins and a wolf on it. The name Two Birds One Stone Will be on the sign. 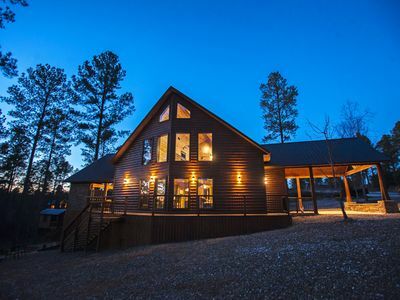 Hickory Ridge Cabin - Secluded Luxury Near Lake/Trout Fishing! 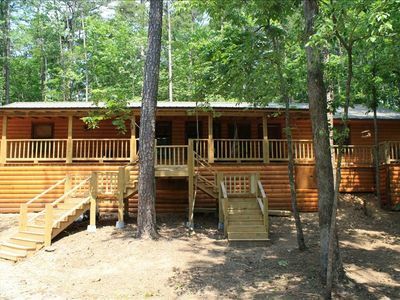 Gorgeous Cabin w/ Great Location- 3 Miles From Broken Bow Lake! 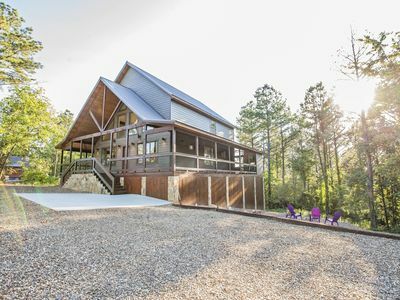 NEW listing - Merging Waters - Native Stone, couples cabin in the Ouachita Mtns. 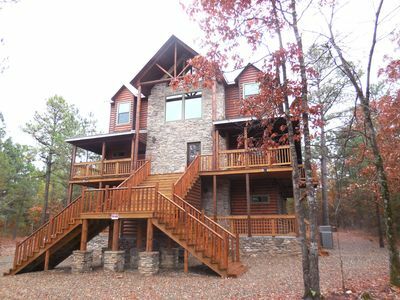 NEW-Peaceful Home w/Yard-15 Mi to Broken Bow Lake! 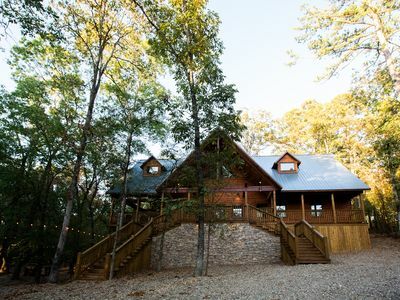 Salty Dog Lodge is about to be your new favorite vacation home!